The performers have announced they will embark on a 12-city stadium tour called Legends of the Summer. The tour will kick off on July 17 in Toronto and finish on August 16 in Miami. Stops on the tour also include New York, Los Angeles, Chicago, Philadelphia and Boston. 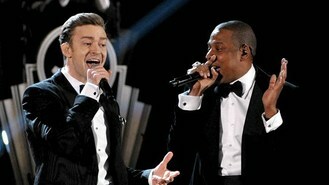 Jay-Z is featured on Timberlake's comeback single, Suit&Tie. Timberlake's new album, The 20/20 Experience, will be released March 19.